Karyna Rodriguez, Neil Hodgson & Richie Miller; Spectrum. A region with prolific petroleum systems, such as in the Santos, Campos and Sergipe Basins; new hydrocarbon prospectivity in Brazil has been discovered in the less explored East Potiguar Basin. 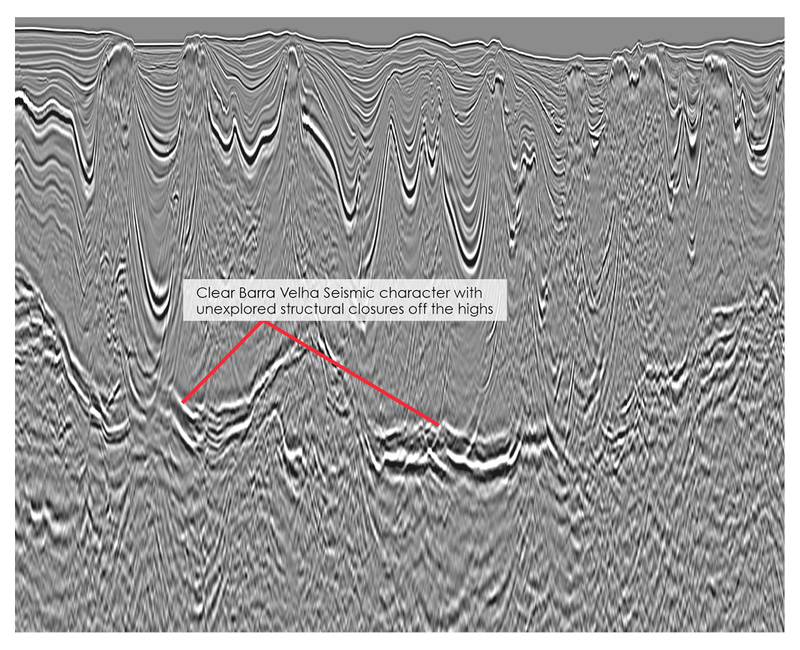 Figure 1: Spectrum’s Regional 2D and 3D seismic data in Brazil. The recent Brazilian licence rounds have been extremely successful but also extremely competitive as the industry has focused on areas with well-established and prolific petroleum systems, such as the Santos, Campos and Sergipe Basins. In the latest round, blocks were also awarded in the less explored East Potiguar Basin where recently acquired 2D seismic data revealed the continuation of the Pitu oil discovery play fairway but within thicker and larger syn-rift structures. In anticipation of future rounds, regional seismic datasets provide excellent coverage of open blocks (Figure 1) offering great insights into their prospectivity. The two seismic examples below are taken from North Potiguar and South Pelotas. Foz do Amazonas is the most northern of the Brazilian equatorial margin basins. The ANP 11th Round presentation quoted in-place volumes of 14 Bbo and 40 Tcfg, demonstrating huge hydrocarbon potential. The recent Liza discovery by Exxon in Guyana has opened up a very prospective play fairway along the margin. Exploration targets have shifted from the complex and high risk slope channel bypass deposits in French Guiana to the more Liza-like distal basin floor fans. Aptian and Cenomanian/Turonian source rocks have been identified with TOCs of up to 10% and 3.5% respectively. Also, a number of low stands are known in the Upper Cretaceous, when sands would have been transported via the slope channel systems into the deeper water areas of the basin. Liza-like basin floor fans have been interpreted on superb quality 3D seismic data. Spectral decomposition analysis indicates that these are disconnected from the shelf and also have a similar flat geometry to that observed in the Liza discovery. The 3D also indicates multilevel prospectivity (Figure 2), including thick syn-rift sections above a clear basement image, a thick and extensive Santonian channel and fan sequence, and a series of Late Cretaceous canyons with infill associated with a decrease in acoustic impedance and clear AVA anomalies. On the south-eastern side of the Amazon Cone, in the Para Maranhao Basin, new and reprocessed seismic data has revealed Amazon Cone specific and Foz do Amazonas look-alike play systems. The Amazon Cone has loaded the underlying crust, generating a structural dip to the south and east. On-lapping this structure are Early Cretaceous basin floor fan clastics sealed by Late Cretaceous mudstones. Well-defined Liza-style plays can be identified in the Cretaceous section as well as Ranger analogues with clear carbonate build-ups on volcanic mounds. All of the plays are expected to be charged with hydrocarbons potentially sourced from Albian and Cenomanian Turonian (syn-rift and sag) source rocks modelled to be oil mature, with thermal maturity models constrained by detailed crustal architecture studies by Royal Holloway University. A detailed interpretation carried out by Pedro Zalan has indicated significant Early to Late Cretaceous syn-rift inversion structures and Tertiary plays in drape, onlap and structural configurations with numerous apparent DHIs (Direct Hydrocarbon Indicators). Two main play types have been confirmed. The ‘Rift’ play follows the Potiguar oil basin off the shelf. It is the same play as Pitu, with clear structures in a thicker Alagamar sequence and well-defined horst blocks at Pescada Formation level seen towards East Potiguar. The ‘Drift’ Late Cretaceous-Tertiary play is a turbidite sand play on-slope in bypass-canyonhead plays, base of slope fans and onlap against guyots, many with amplitude anomalies showing brightening in the far angle stack. Recent seismic in East Potiguar clearly shows that there is enough sediment overburden in the area for the syn-rift source rocks to be in the oil window. In the case of the mapped structures, these would be directly over mature source rock, taking away the risk associated with long-distance migration. Pernambuco is an unexplored offshore basin with indications of light oil. Legacy seismic shows the extension of Alagoas-style potential in channel-fill sediment plays, rifted basin fill and faulted Palaeozoic sediments. Indications of salt-related traps are expected to be confirmed by the survey currently being acquired by Spectrum in this area. Significant potential is also inferred in post-rift carbonate build-ups associated with palaeotopographic highs formed by outer basement highs, salt diapirs and magmatic structures. Brute stacks from the new survey are already indicating the presence of several basins with thick sediment accumulation over potential source rocks. Evaluation of modern, high quality seismic data in Sergipe has led to the confirmation of the extension into open acreage of proven turbidite channel systems of Mid to Late Cretaceous and Early Tertiary ages. Untested basin floor fans dipping landward and pinching out towards the Mid Oceanic Ridge are associated with AVA anomalies similar to those of the discoveries. 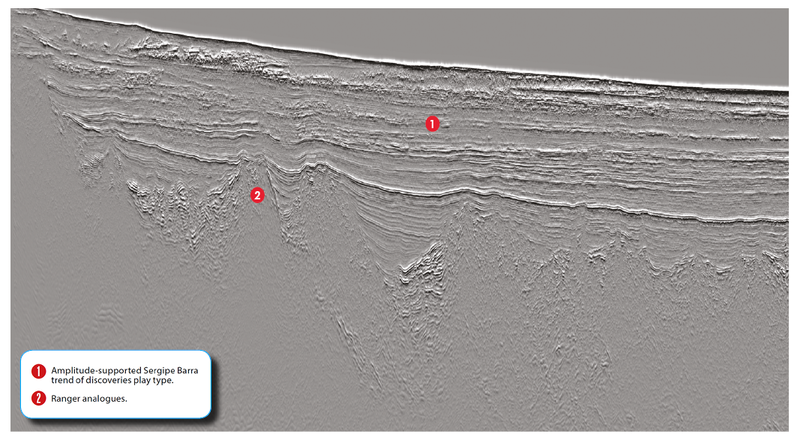 Integration of available seismic and potential field data has resulted in the identification of multiple as yet untested play types in this basin. With calibrated amplitude support and pre- to syn-rift analogies in the successful targets in the conjugate Gabon margin, modern tools are available which confirm that the undrilled potential offshore Sergipe easily surpasses the discovered resources to date. Extensive amplitude anomalies associated with a decrease in acoustic impedance in the same setting as the multibillion barrel discoveries in Sergipe extend into Camamu. Interestingly, a series of volcanic features with potential carbonate build-ups on the crest (Figure 3), very similar to the recent Ranger discovery in Guyana, are observed. With increased competition from oil companies in the Santos Campos basins, success in one of the most prolific play types in the world will come from a good understanding and integration of the micro and macro scale characteristics of the prolific Barra Velha Formation reservoir, which indicate a shallow water lake depositional model. This, together with access to a good quality regional dataset outside the old salt polygon area, should allow identification of the more subtle unexplored traps (Figure 4), which may be overlooked by campaigns aiming to only explore clear analogues to discoveries. Huge additional potential is indicated by this model, painting a very exciting future for a well-informed exploration campaign. The Pelotas Basin is one of the world’s last remaining unexplored basins with significant Tertiary and underlying Cretaceous deltas, where both display abundant evidence of coarse clastic reservoirs. Pelotas has proven source rock in offset wells and conjugate basins, oil seeps proving a working hydrocarbon system and one of the world’s biggest gas hydrate deposits demonstrating the presence of abundant methane. Additionally, the high quality seismic acquired in 2013 shows abundant structures with both structural and stratigraphic traps. This basin has truly awesome multi-billion barrel potential and perhaps the forthcoming licence round will give her a time to finally shine. There are open blocks in both frontier and mature settings with plays to suit different exploration strategies and portfolio types. There is huge untapped oil potential along the whole Brazilian margin and regional seismic data, such as the 304,145 km of 2D and 19,017 km2 of 3D offered by Spectrum, provide the evaluation tool of choice that will allow these basins to be evaluated, ranked, accessed and success delivered. Never before has so much acreage been covered by seismic data available to so many, imaging the plays that work and lighting the path for future glory. Whilst the white heat of sub-salt exploration in the Santos and Campos Basins of Brazil’s Atlantic Margin has yielded extraordinary success, its southern sister, the Pelotas Basin, has seen little attention for over ten years, despite displaying clear direct hydrocarbon indicators. 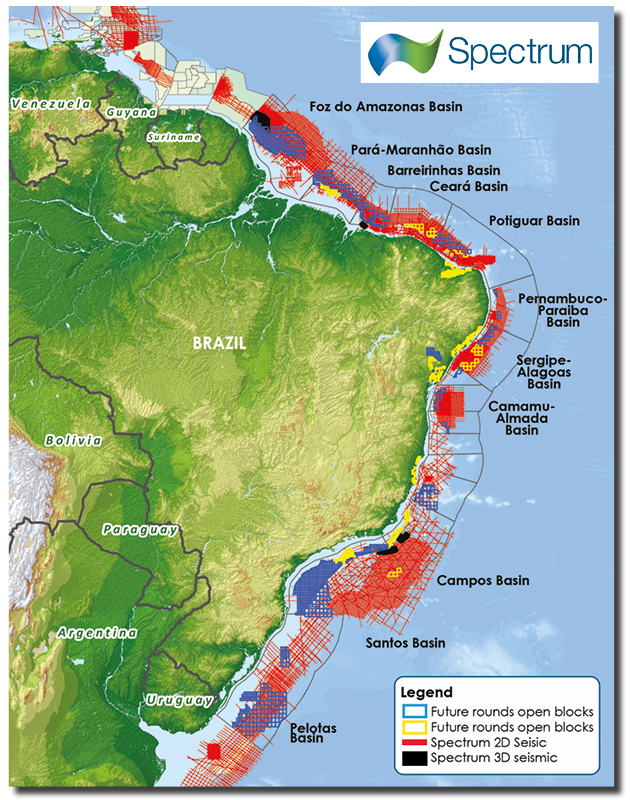 However, a new 2D seismic program acquired in 2013 is revealing new evidence for sand-rich systems and oil plays, making the deepwater Pelotas Basin an excellent choice for blocks to be nominated in Brazil’s upcoming Bid Round 13. North Sea Renaissance (NSR) is an ongoing long offset 2D seismic program that will total some 85,000 km at the end of this year. The program is acquired with a cable length of 8,000 m, while data processing is optimised for the purpose of deep imaging and AVO capabilities.